Yes! You do not have to know anyone associated with the retreat nor know anything about hypnosis, spirituality, meditation, or yoga. What activities are included in the retreat? Lodging (not included in "Commuter"), plant-based breakfast and lunch meals, snacks, group hypnotherapy, yoga classes (all levels), breathwork classes, guided nature meditations, Tibetan bowl sound bath meditation, Joshua Tree National Park guided hike, and all 47 of Cynthia's audio mp3 downloadable hypnotherapy sessions (a $100 value)! Swimming (when weather permits), Wildlife watching, Enjoying spectacular sunrises and sunsets, Stargazing, Photography, Relaxing by the fire pit, Board games and Puzzles, Journaling, and Exploring world-renowned Joshua Tree National Park and the local town. You can also purchase a private massage or private yoga class. Great question! Please check out my Frequently Asked Questions page about hypnotherapy. What to bring in terms of clothing will depend on the weather. The desert can be unpredictable. Evenings tend to be chilly, regardless of daytime temperatures. For that reason, please check the forecast for appropriate clothing. Yoga mats, yoga equipment, blankets, pillows, as well as tempurpedic memory foam pads for hypnotherapy and breathwork are provided. A car is not necessary once you're at the retreat, as there are taxis and Uber available. However, we highly recommend that you do rent a car if you want to explore the local area. If you fly into Palm Springs, you can rent a car at the airport (or take a taxi or Uber). If you take a taxi or Uber to the retreat center, Enterprise Car Rental is also close by the retreat. If you want to visit Joshua Tree National Park, Pioneertown, (maybe even Palm Springs), or simply have the freedom to come and go as your please for meals, then renting a car is the way to go. The retreat center is not within walking distance of anything. The Mojave desert is a unique area, and if you're a first-time visitor we don't want you to miss some of its spectacular sights! Having said that, we do have out-of-town participants choose to spend their entire time at the retreat, as it's very relaxing. And, as mentioned, Uber is available too. Prices start at $695.00, please visit the Registration page to see prices and available rooms. Register online on the Registration page. If you are unable to register online, please Contact me. Yes! We want to make this as easy as possible for you to attend. Please contact Cynthia directly to set up installment payments that work within your budget. Please allow 10 business days for your refund. Sure! Contact Cynthia immediately so that we can get your friend registered and ready to go. Here are the key amenities that you will find on the property. There are three separate structures with a minisplit heating and air conditioning unit in each room. Sitting atop a hill at nearly 4,000 feet above sea level, on most days simply opening screened windows offers very effective cross ventilation for cooling. The house includes three bedrooms, two bathrooms, living room, kitchen, dining room, sunroom, laundry room, and communal office. Two of the bedrooms offer queen beds and share a full bathroom off the hallway. The master bedroom offers a California king bed and is en suite with its own bathroom (with both shower and bathtub). The pool house, which is a charming converted horse stable, includes three bedrooms (one en suite) and one bathroom. The en suite bedroom has a queen bed, one bedroom has two twin beds, and one bedroom has a queen bed with a pullout queen sofa. The retreat studio is a single large room (20 feet by 30 feet) that can accommodate approximately 15 yoga enthusiasts. It can also be configured to accommodate meetings with perhaps 12 participants seated comfortably. The swimming pool offers a cooling respite on hot days. The pool is not heated so the pool temperature will depend on the outside temperature. There are loungers for relaxation. There is ample seating and lounging furniture on the various patios and decks. There is also an outdoor picnic table that seats six for alfresco dining. There is a converted a large Chinese wok into a propane fire pit. It is the perfect place to sit on cool nights under a blanket of stars. The architectural style of the buildings might best be described as “high desert ranch”. The original portion of the house is constructed of brick with open beam sloped ceilings. Most of the floors are rustic Mexican Sautillo tiles. All bathrooms are stocked with hand soap, body wash, shampoo, conditioner, and hair dryers. Towels and wash cloths are provided for each guest. All meals served are plant-based. Breakfast includes fresh fruit plates, granola, cereals, bagels and cream cheese, tomatoes, yogurt, avocado toast, juices and milks. Lunches are brought in from a Palm Springs vegan chef who uses organic and local foods. When wheat or gluten products are served, alternatives are provided. There will be snacks available at all times. If you need to supplement the food offered, you may bring your own food. Communal spaces are plant-based only. You absolutely can! However, the retreat space is plant-based, so there will be no meat served or allowed to be cooked or eaten in communal spaces. You are welcome to have animal products in your bedroom (like freeze-dried jerky). You are free to opt-out of the breakfast and lunch meals and dine at the local restaurants, if you prefer. Dinner is not included for the purpose of you to enjoy a meal of your choice and craving. Exact address in Yucca Valley, CA will be given after registration. GPS Maps will give the best directions. We encourage you to fly into Palm Springs, as that is the closest airport. Plus, Palm Springs is a wonderful vacation destination. If you have never been, we suggest spending a day exploring that city either before or after your retreat. If you prefer not to rent a car, there are taxis (Desert City Taxi), Uber, and shuttles (AM/PM Shuttle Service) from Palm Springs to Joshua Tree. Uber services the Joshua Tree area, and there is an Enterprise Car Rental near the retreat if you decide to rent a car. If you are flying into LAX and do not want to rent a car, we suggest you take Tesloop (Tesla's city-to-city car service). 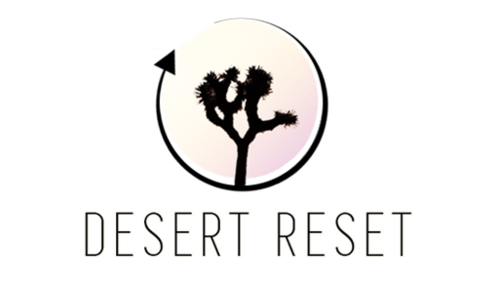 It is very reasonably priced and reliable, other LA-based Desert Reset participants have taken it to the retreat in the past. Please let us know if we can assist you with anything else that's on your mind.